John Pasquin may be the only professional on Earth who thinks that Tim Allen is funny, as he’s stuck by the comedian’s side for years now, directing shows & movies, flops all, but the devil may care. The Santa Clause, Jungle 2 Jungle, Home Improvement, Joe Somebody, Last Man Standing; Pasquin & Allen are a veritable dynamic duo, except not dynamic, more like sad. I kid, but these guys make awful shows & films together, and I was a huge fan of Home Improvement as a youngster, watched it with my family every week, but now, looking back, I can recognize that it was absurdly terrible. 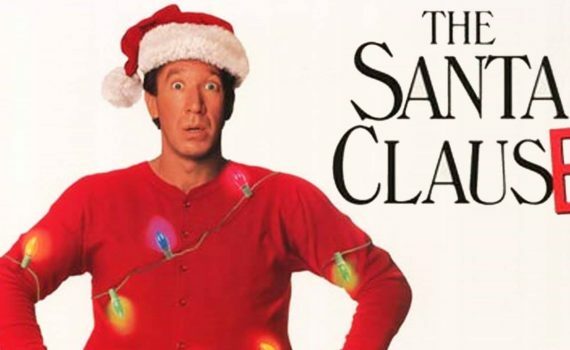 Tim Allen is basically talentless, and lest you think I despise everything he does, let me just say, The Santa Clause is one of my favorite Christmas films. I guess many of us have the ability to separate our hearts from our minds, and anything Tim Allen does must enter the heart category, because if you think about it for too long, you realize that the guy is insultingly bad. Scott and Laura Calvin have divorced, leaving their small son Charlie somewhere in the middle. Scott works as a sales executive for a toy manufacturer, is great at his job, makes the company a ton of money, but is always at the office, never has time for his boy. Laura has remarried a psychiatrist named Neil who is attempting to mold Charlie into an intelligent, pragmatic individual, including finally allowing the myth of Santa Claus to fade into youthful dreams. Scott doesn’t want Charlie to give up hope in Santa Claus, and on Christmas Eve he gets the opportunity to show him that Santa is flesh & blood. Frightened on the roof, good ol’ Santa falls off, shocking Scott & Charlie, especially when a card on his person reads “wear my suit, become St. Nick.” And when Scott does, the reindeer take them both to the North Pole, a land of wishes & wonders that no one back in the real world believes in. I can think Tim Allen is terrible and still have a special place in my heart for this film, those things aren’t mutually exclusive, as the phrase goes. He’s just not funny, not an actor, not likeable, and a bit of a schmuck. But he’s made a career out of slapstick humor and his once brand of pseudo-masculine comedy, so more power to him I guess. As far as the film goes, I think you have to watch it around 8 years old in order to love it, and if you do, it will never go completely away. I’m still fond of the quotes, the characters, and the silly jokes, even though I know the movie it incredibly juvenile and not really that well-made. But hey, it’s got Judge Reinhold in it, so that’s something, and honestly he’s probably the best part of the film, right up there with Bernard & Judy the elves and the inherent hilarity of a regular man slowly turning into Santa Claus, white hair, big belly, and all. Holiday favorites are odd, that’s for sure, and there’s absolutely no accounting for taste.